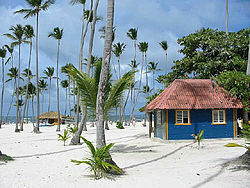 The oldest hotel in the area, Barcelo, is past the crossroad Coco Loco and Villas Bavaro I and II (left side). One of the newest hotels is the Now Larimar Resort. The Cocotal Golf and Country Club is in front of two Melia Hotels (Paradisus Palma Real, Meliá Caribe Tropical) and the shopping mall, Plaza Palma Real. Beyond the Melia Hotels is El Cortecito, the first sand road was connecting Punta Cana International Airport. The oldest building in Los Corales (where El Cortecito starts) is Pirata, now home to three beach bars: Bamboo bar, Soles and Umi.